autumn alpine adventures. – on my way: make it someday. This summer I was on quite a string of trail running/hiking jaunts, accumulating miles of distance and thousands of feet of elevation every weekend. It’s funny how these things go in fits and starts. Work gets crazy and all of a sudden it’s hard for me to put energy into planning weekend trips. Or I prioritize a rollerski instead, and bid the mountains farewell til next week… or the week after… or the one after that, when I spend hours planning where to go only to then look at the forecast and see rain. Plus, to try to fit in so much exercise (let’s not exactly call it “training”, shall we?) I had tried to find routes which were not more than an hour or two’s train ride from Zürich where I live. There’s plenty there, but it led me to start from similar places a few weekends in a row. There’s a lot of different pockets of mountains – infinite pockets, really – but I wasn’t seeing much of that diversity. Good workouts though. I was running myself all around a two-hour radius of the city. But not recently. And it also happens that I hadn’t seen my friend Greg in many weeks- maybe months? We finally connected when planning a trip to La Sgambeda, a ski marathon in Italy, in early December, and remembered: yeah! We should go hiking! In a moment of serendipity, we had been both looking at doing the same hike earlier this summer and neither of us had ever gotten around to it. So we met up on Sunday to finally conquer the beast and get some high elevation views in. 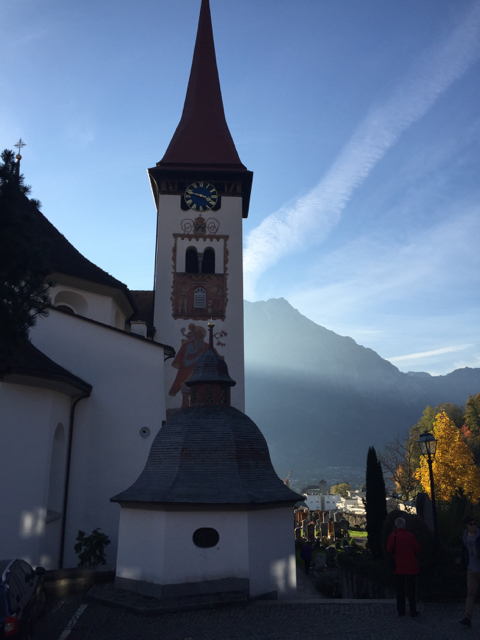 We took the train to Schwyz, a city in the region outside of Zürich and one of the closest places with relatively big mountains. Then we took a bus up a winding valley to Muotathal, a town of a few thousand people on the Muota river. Muotathal is most famous (or only famous?) for having six men who are called the “weather prophets” who predict the weather with various strange methods. One basis is, for example, anthills. You can see their latest predictions and stories here. But I digress. 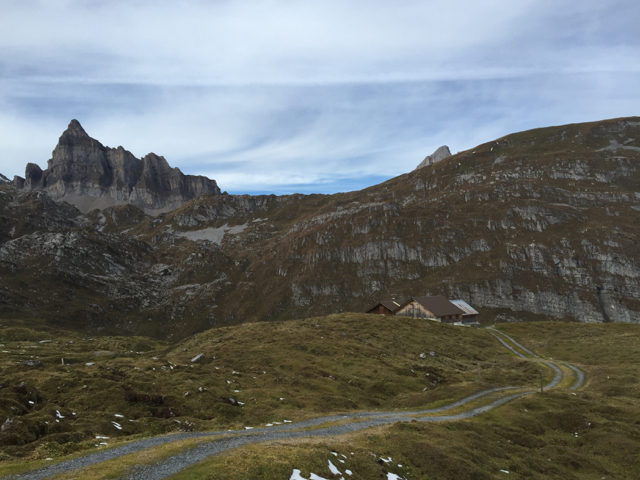 We wound up in Muotathal and started hiking up through steep cow pastures and then past small “alps”. 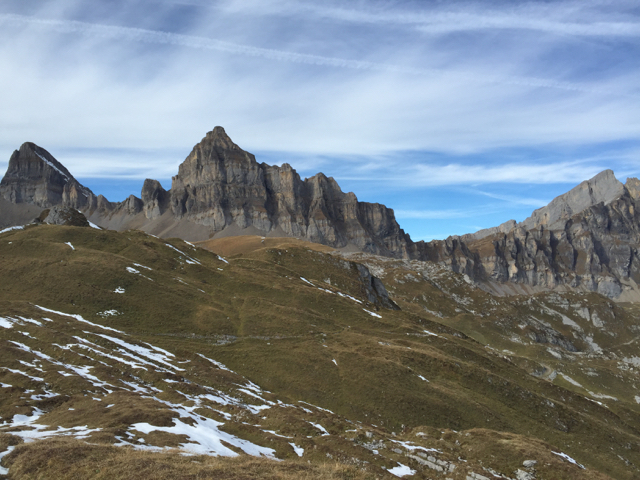 In Switzerland, the Alps are not just mountains. 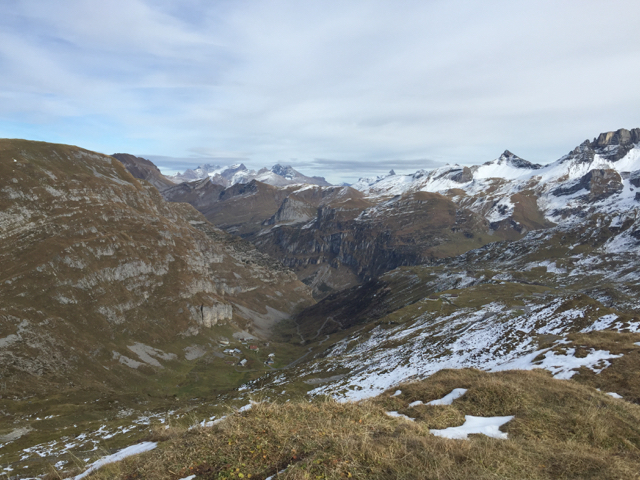 An Alp is also a hill farm, and is likely but not guaranteed to sell cheese or other products. Looking back across the valley as we climbed higher, the views were amazing. 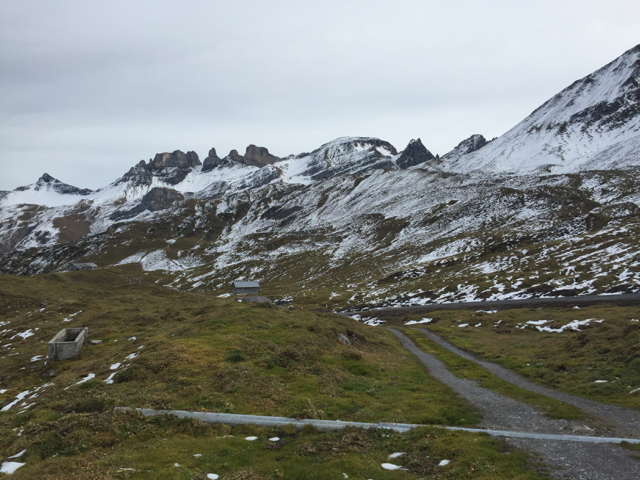 Although we had taken the bus just under 30 minutes from Schwyz, it felt like we were infinitely further into the mountains: deep in them, surrounded, far from anything. Schwyz, on the other hand, feels very much like the border of the mountains. 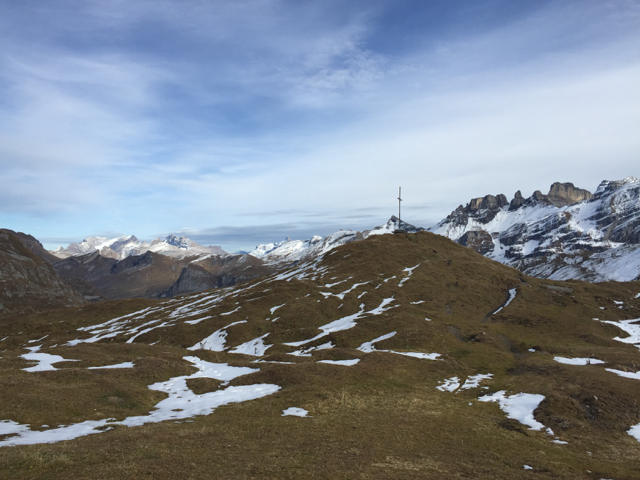 It is surrounded by a few charismatic peaks like Rigi and Grosser and Kleiner Mythen. But those peaks are filled with people and have restaurants on top. They look out in one direction to the mountains and glaciers, but in the other over large, beautiful lakes dotted with cities, and towards the Swiss Plateau. 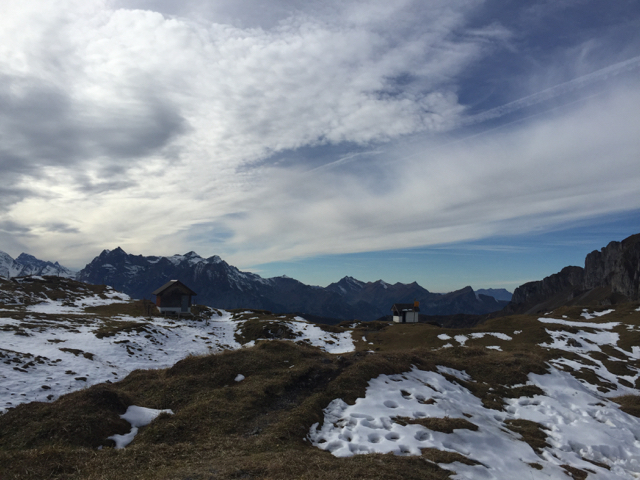 We were definitely not on Rigi. And I was reminded that autumn is one of the most beautiful times of year to be in the high mountains. The alpine tundra vegetation was turning completely golden. Not so many deciduous shrubs and trees here, instead the gold was bordered by the dark green of Switzerland’s ubiquitous conifers. We stopped to eat lunch and admire the view. Then we kept going. This turned into one of those hikes where we kept seeing a height of land ahead, or a space between two hills which we assumed we would go through and then be on our way down the other side. Mostly, we weren’t there yet. Greg and I both suffer from a problem with scale in Switzerland. No matter how many times I look at a map, I can’t internalize how big 1000 or 1500 meters of height is. In my head I can say, “yes, this route will take us up 1500 meters. That’s almost 5000 feet.” But I still don’t understand what 1500 meters is. And so I’m hiking and I keep thinking, I must be there yet. And I’m not there. And I keep going up and up and up. But we were excited (even if exhausted and in pain) because we were creeping closer and closer to the snow. We passed a surprisingly large collection of farm buildings – what are they doing up there!? – and at one point walked along a perfectly graded dirt road. Seriously, there are roads in New Hampshire which get regular traffic and are in far worse shape. It was hard to picture anyone driving up here. After 2 1/2 hours, we finally got to Chinzig peak/pass, and it was definitely worth it. Here’s some culture. We were hiking along a section of the Via Suworow. I know very little about Swiss history, but it turns out that Napoleon’s French army invaded Switzerland in 1798. A Russian general named Suvorov (Suworow spelled more like in Russia, I guess) marched up from Italy to try to push the French out. 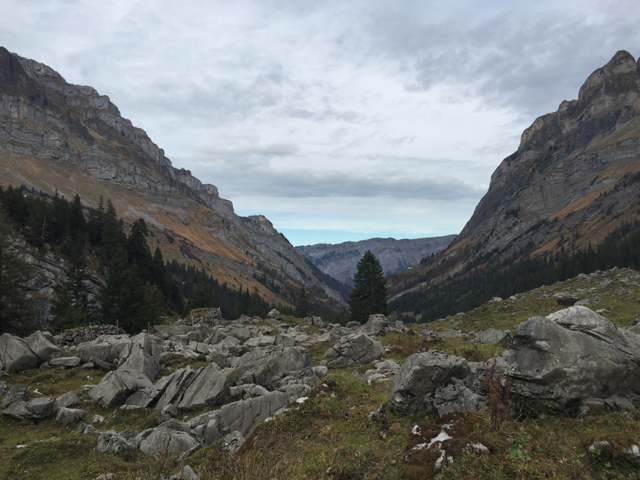 He and his army couldn’t handle the French, however, and had to turn around in Glarus, the canton south of Zürich. As they marched to escape south, they crossed this peak/pass and many others. The scenery is beautiful, but I’d rather not be walking it as I fled. After eating lunch, we began wandering down to a cablecar station where we could save about 1000 meters (that’s 3000 feet) of wear and tear on knees and legs by getting a ride down. A very expensive ride, as it turned out. And then we had just barely missed the bus into the nearest big town, Altdorf and Flüelen. It only came once an hour. Shucks! We wandered down into the small town of Burglen to look for a cafe or somewhere to wait out the time. We weren’t really successful…. …. 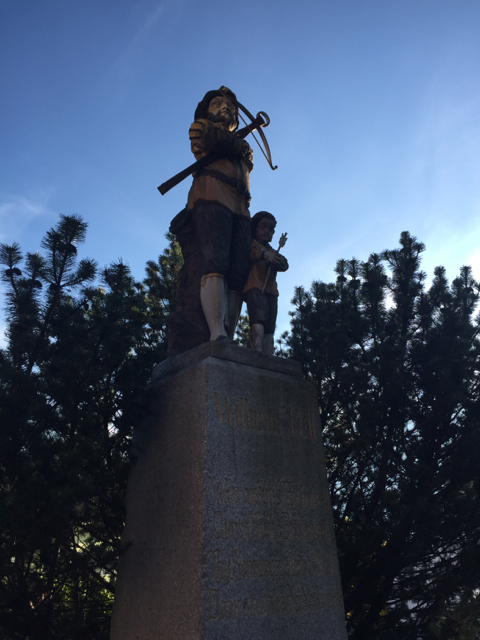 but, it turns out that Burglen was the hometown of William Tell. William Tell! Did you even know he was Swiss? I’m not sure if I remembered that or not, but it was in Altdorf, just down the hill, where he assassinated a lord representing the Hapsburg dynasty. Swiss don’t like being ruled by monarchs; Switzerland is a confederacy. Therefore, Tell’s act is a legend of action against tyranny. Also, that one time he shot an apple off his son’s head. Another thing I didn’t know, and probably you didn’t either, is that actually there’s no proof that William Tell or the Hapsburg lord ever existed. They might just be fiction. Anyway, we saw a sort of creepy statue of Tell and his son. There was also a Tell museum which we didn’t go into. Burglen was a pretty little town. Eventually we made it to Flüelen where we could buy some chips to get that salt craving under control, and hop on a direct train to Zürich. With the bus snafu, our 15 k hike which was just one canton away from Zürich had turned out to take pretty much all day. I crawled home to cook dinner. I’m hoping to get in at least one more high altitude hike/run before it really becomes winter, but ski season is coming. More importantly, we’re nearing the time when it’s not so great to hike (too much snow) but not yet time to ski (not enough snow). Most importantly, I’m swamped with fieldwork and trying to prepare for a PhD committee meeting. But we all need some personal time, and for me the best personal time is in the mountains. So I’ll find a good route and get up high one more time, at least. ← part 2: suppressed results.